Handground is made from over 40 different components that represent 11 different types of material. The entire drive train is made from solid steel and aluminum and the axles are supported by brass bushings. We will go through the major components and their material types by each number listed on the image above. The top is made from ABS plastic. Inside of it is a gearbox that has 4 brass bushings which support two stainless steel axles and hardened steel miter gears. 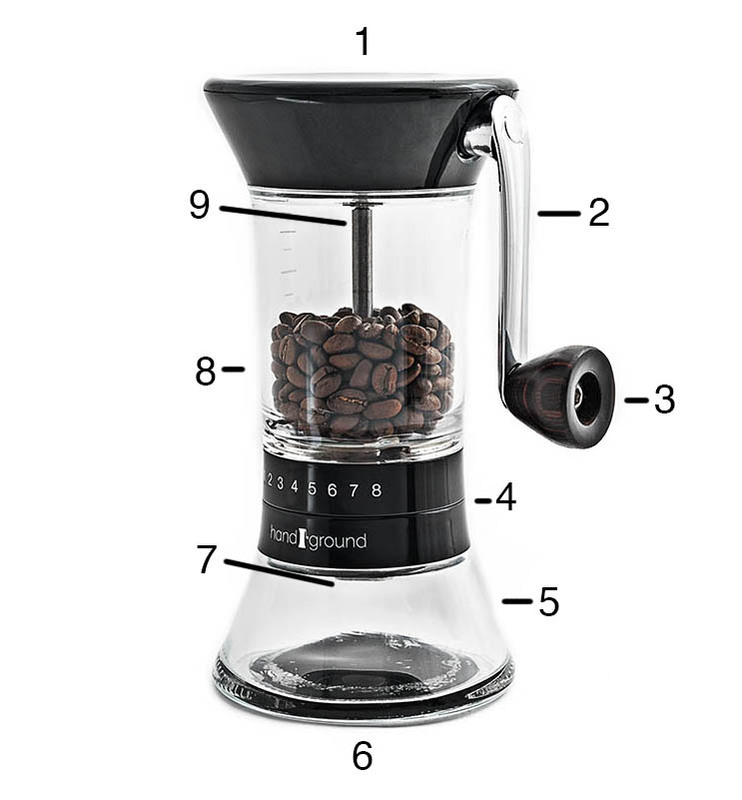 The handle is made from solid, die cast aluminum which gives it a lot of strength for grinding lightly roasted beans. The knob is made from Pakka wood. It's made by compressing together many layers of tropical hardwoods and then it goes through a treatment process to bind the layers together so they can withstand years of use with no cracking or splitting. The outer adjustment rings are made from ABS plastic. The inner stepper piece and steps are made from POM plastic because it has better properties to resist wear over time as the stepper travels up and down the steps. 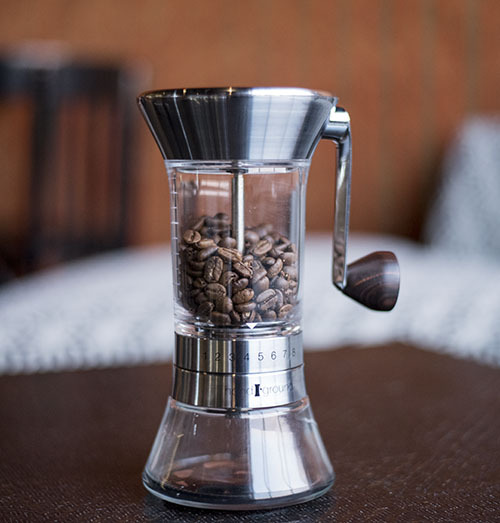 The catcher is made from glass to reduce the amount of static that builds up during grinding. It also has a clear silicone ring around the top threads to provide a snug fit when the catcher is tightened on. The hopper is made from PMMA, also known as Acrylic. The nickel grinders go through a few more steps to achieve the brushed nickel finish.